about the media Booklet with introduction and texts on the four projects. about the project ‘Rural Responses’ came forth from a cooperation of the Arts Council England and West Midlands. The aim of the initiative was to support the development of public art projects in rural areas. Artists were invited to hand in proposals for projects themselves, instead of being given directed assignments. At the time ‘Rural Responses’ was being prepared, the impact of the foot and mouth outbreak was just beginning to be recognised. 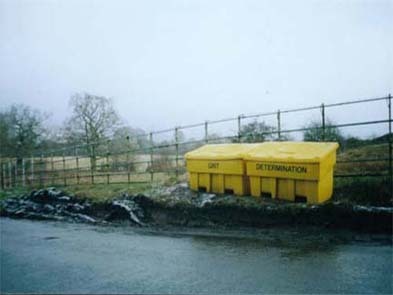 The selection of the artists’ proposals following the open call was being made even more careful – the proposals had to be engaged with the concerns and interests of rural communities in the West Midlands. about artist and participants Eight artists had the possibility to work out their plans, resulting in four projects. 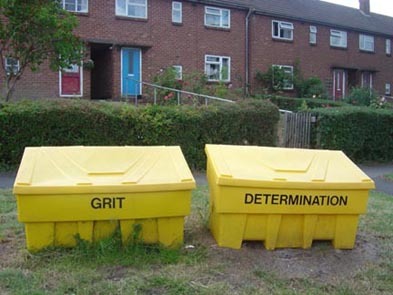 Perhaps the most simple but also most effective project was the one by Alex Johnson and Nina Coulson (Yoke and Zoom): ‘Grit & Determination’.